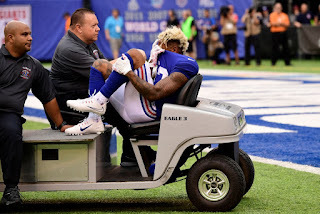 The New York Giants are now 0-5 and to add insult to injury, saw WRs Odell Beckham Jr, Brandon Marshall and Sterling Shepard all suffer injuries in week 5. Beckham suffered a fractured ankle and his season is over. Don't worry about looking at their depth chart to add a player (Roger Lewis) in fantasy football because their next two games are at Denver and against the Seahawks before a week 8 bye. Evan Engram and Shane Vereen are the only bye week fillers on the roster at this point and even they are only useful in the deepest of leagues. For those of you that are looking to "replace" OBJ, the Falcons, Broncos, Saints and Redskins are coming off their bye week and can provide you with options you can use each week moving forward. However, there are limited options on those teams. Jamison Crowder's ownership on Yahoo is down to 60%, but go see if he is available in your league(s). For those of you playing with standard scoring, Ted Ginn Jr. is owned in 45% of Yahoo leagues and is a boom or bust player worthy of a roster spot. I think he is more valuable with Willie Snead back. At 17% ownership, Taylor Gabriel could be a nice add with Mohamed Sanu missing a game or two. We all remember what he was capable or doing last year! The Broncos only have two fantasy options at WR and both Demaryius Thomas and Emmanuel Sanders are healthy coming off Denver's bye week. Donte Moncrief (50%) - Andrew Luck is close to returning for the Colts and Indianapolis doesn't have their bye until week 11. Mike Wallace (33%) - 188 receiving yards receiving in last two weeks and has four games before the Ravens bye. Nelson Agholor (31%) - Carson Wentz has looked great this year and Agholor has been a huge part of his success. After a road game on Thursday at the Panthers, the Eagles have three home games before their week 10 bye. Kendall Wright (14%) - If you want to sneak a player onto your roster before waivers, add the Bears WR with rookie QB Mitch Trubisky making his NFL debut on Monday Night Football.